Ian Michael Hendon was born in Ilford on the 5th December 1971 and represented England Schoolboys before joining Spurs as an apprentice. He won seven England under 21 caps before joining Leyton Orient in 1993 making some 130 appearances. Naisbitt, Pluck, Hendon, Heald, Flynn, Gower, Yakubu, Doolan, Toms, Agogo and Purser. Ian featured in five games during this loan spell scoring one goal until he signed for Peterborough United in late January 2003 much to the disappointment of the Barnet faithful. 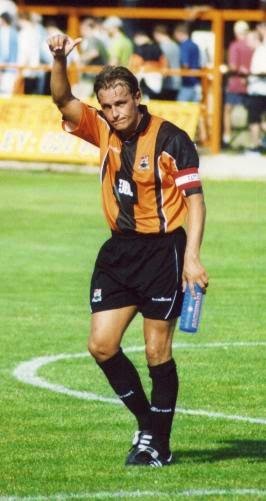 Thanks to Martin Allen, Ian returned to Underhill for the start of the 2003/4 season on a free transfer. He became an overnight cult hero with his aggressive yet cultured style of play at full back or centre back. Hendo’s iconic status at the club then blossomed very quickly even when he conceded, albeit with smile during a questionnaire by the BFC Supporters Association that one of his pet hates was “answering bloody questionnaires”. In September 2003 Barnet were away at Stevenage Borough. With the Bees a goal down an injured Hendon was substituted at half time. Yet, instead of taking his place on the bench next to his manager he hobbled around to the stand behind the goal where the Barnet fans were massed and took a seat amongst hordes of his disciples even joining in with the chanting. The decibel level increased ten fold, as did the belief. Peter Beadle equalised and then goal machine Giuliano Grazioli grabbed the winner. Cue euphoria in the visitor’s enclosure. Captain Hendo eventually surfaced from below a mound of admirers beaming from ear to ear. That is how you get inside the very heart of a supporter. In March 2004 Allen moved on to Brentford allowing Hendon and Danny Maddix to briefly become joint caretaker-managers before the arrival of Paul Fairclough. That season of course ended in heartache as the club narrowly missed out on a play-off final at the hands of Shrewsbury Town who won a tight semi final tie on penalties. The following season however Ian captained the side to glory winning the Football Conference and therefore promotion back to the Football League, by a country mile and leading by example. Ian continued to nurture his reputation with the fans wearing his heart on his sleeve and bleeding amber blood becoming the penalty king of Underhill. At the end of the 2006–07 season, Hendon faced a dilemma. Initially, he was not offered a new playing contract by Barnet, but was given the chance to join Paul Fairclough's coaching staff. He was forced to decide whether to seek to further his playing career with another club, or to stay with the club he had grown to love, and start his coaching career earlier than planned. He decided on the latter, to work as Assistant Manager. At the end of the season Ian was presented with the Lester Finch award from the BFCSA for “Outstanding Contributions to Barnet FC”. 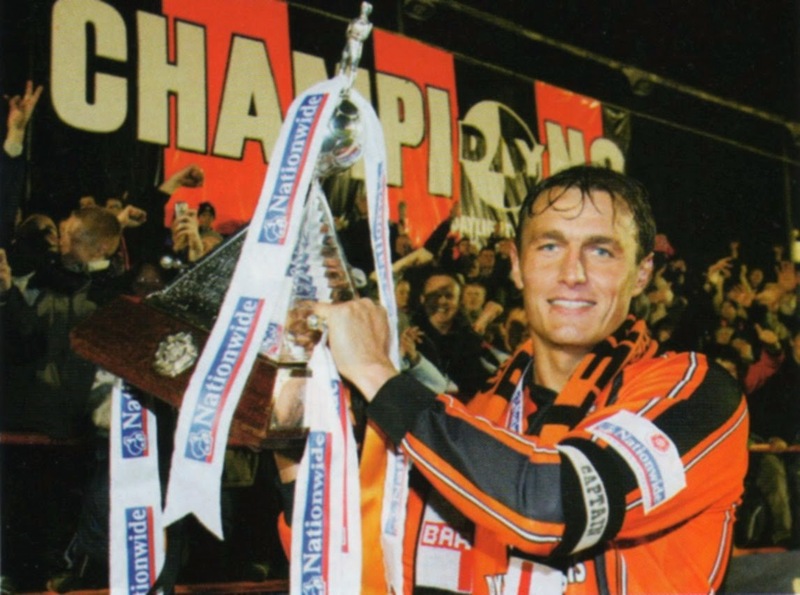 In April 2009 Hendo took on the role of Manager at Underhill with a two year contract – but after an outstanding start to the 2009/10 season, results and a disastrous run of form left the club fighting relegation. Modern football management is a very tough occupation and the game has had to lose its soul as results are literally everything. Quite possibly the one man that fans would have given their all to see succeed in the job was relieved of his position less than a year later. After a very short spell as manager at Dover and a period of assisting long time friend Andy Hessenthaler at Gillingham Ian is currently first team coach West Ham United under another old pal Sam Allaydyce. It will take a very special player to fill Ian's boots and even they are just a size 8 by the way. I know this because I have and treasure a genuine well-worn pair given to me by Ian as a souvenir from Barnet’s Conference winning season in 2004-5. 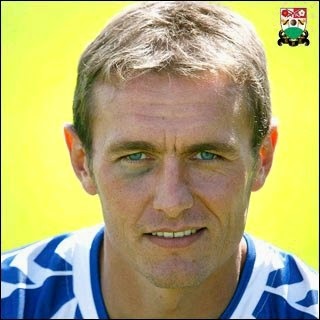 Ian Hendon will be a cult hero to Barnet followers forever more I have no doubt of that.